Following Christ is the most important decision a person can make, but after the initial excitement wears off, it’s easy to become overwhelmed. What does it really mean to follow Jesus, and what does it look like? New believers can wonder if they’re the only ones who have questions about their faith, and they may wonder if faith will always be confusing. But there’s good news. The gospel doesn’t have to be complicated to be understood, trusted, and followed. 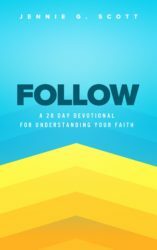 In Follow, a 28 day devotional, Jennie G. Scott helps you understand four components of Christianity: salvation, the Bible, prayer, and worship, and she helps you establish the habit of spending time every day reading Scripture and talking to the Lord. To purchase Follow, click here. We all want God to do great things with our lives, but many of us secretly believe he can’t. We tell ourselves we’re disqualified from a deeply meaningful and satisfying life because of decisions we’ve made, personality traits we lack, and decisions that derailed us. We live with a deep belief that somehow we’re not enough for God to want us. But in believing we’re disqualified, we’re discounting grace. We’re limiting God, and we’re acting as though our behavior determines God’s plans. 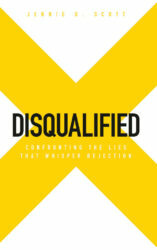 In Disqualified, Jennie G. Scott explores the lies of rejection we commonly believe, and she explains how Jesus Christ redeems every part of our lives to spread his message of grace. To purchase Disqualified, click here. It’s no secret that teachers have an incredibly important and extremely difficult job. Every day, they have the opportunity to impact their students and change the course of their lives. Before the Bell reminds teachers that each child is a miracle of God and each day is a chance to shine His light into their classrooms. 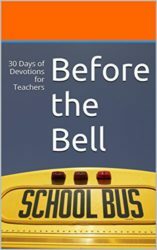 These five-minute devotions begin with Scripture and end with prayer, helping teachers focus their thoughts before facing their students. To purchase Before the Bell, click here. We women are overwhelmed with our lives. We say yes when we should say no, we say we’re fine when we’re really not, and we take on more when we should be letting go. The responsibilities of family, work, and home are exhausting and depleting us, and it’s time to reclaim our lives. In my e-book Buried, I walk women through five practical and tangible steps to take on the journey to managing their responsibilities. Each step builds on the previous one, and once women complete them, they will find freedom, focus, and breathing room in their lives. 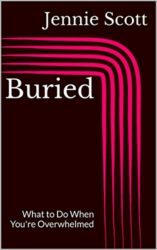 To purchase Buried, click here.